When the ground shakes, and a poor nation’s economy is destroyed; when the waters rise, washing away a community’s hopes and dreams; when a child suffers neglect and abuse; when violence tears apart nations; where is God? If God is all powerful, and if each one of us is a beloved child of God, then how can God allow tragedy and suffering to infest his creation? In Why? Making Sense of God's Will best-selling author Adam Hamilton brings fresh insight to the age-old question of how to understand the will of God. Rejecting simplistic answers and unexamined assumptions, Hamilton addresses how we can comprehend God’s plan for the world and ourselves. Adam Hamilton is senior pastor of the United Methodist Church of the Resurrection in Leawood, Kansas, one of the fastest growing, most highly visible churches in the country. 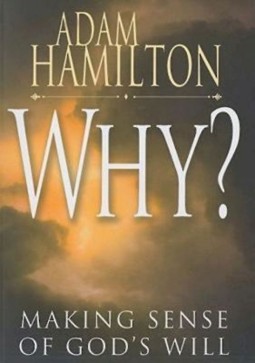 The Church Report named Hamilton's congregation the most influential mainline church in America, and PBS’s Religion and Ethics Newsweekly identified him as one of the top “Ten People to Watch.” Hamilton is the best-selling and award-winning author of 24 Hours that Changed the World, Enough, When Christians Get It Wrong, Confronting the Controversies, Making Love Last a Lifetime, Unleashing the Word, Leading Beyond the Walls, Selling Swimsuits in the Arctic, Christianity and World Religions, and Seeing Gray in a World of Black and White, all published by Abingdon Press. Huffington Post Article - "Japan's Earthquake and the Will of God"